No matter where we live or what language we speak, food is an essential factor that shapes the way we think, feel, act, and respond to one another. 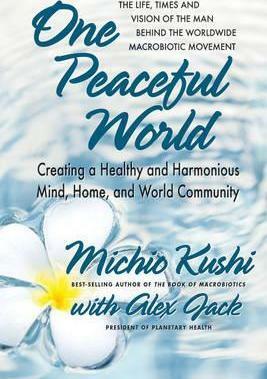 In this milestone book, Michio Kushi presents his vision for building world peace through a sane way of eating. As the leader of the modern-day international macrobiotic movement, Michio has taught, lectured, written, and worked steadily to achieve his view of the future–a world in which all people can live in harmony with nature and with one another. In 1987, he launched his One Peaceful World society, a worldwide educational organization devoted to bringing about world peace through a new awareness of the links between food and the emotions, natural law, history, and international order. This book lays the foundation for One Peaceful World. It includes case studies throughout history in which macrobiotic diets relieved conflict and sickness. It traces the rise of the organic and natural foods industry, to which Kushi has been a notable contributor. It offers menus and recipes, reference sources, and a wealth of information that point the way to a new approach to diet and thought. And it recommends additional actions that we can take to bring unity to the world. The book is divided into four parts. In Part 1, Kushi details his early life in Japan during World War II, and his journey to macrobiotics under the guidance of George Ohsawa. Part 2 delves into the cosmological and universal concepts behind macrobiotics, including the importance of yin and yang. In Part 3, Kushi discusses the values that are essential to creating One Peaceful World in modern times. And in Part 4, the author looks forward to a new world government. One Peaceful World is an important and fascinating book for anyone committed to good health, whole foods, and world peace.